I was never really a runner. I had the mandatory high school gym classes and flirtations with it when I was a freshman in college, but never really got to the point where I considered myself a runner. I wasn’t out of shape, due to years of Kung-Fu, but my muscles were not trained for that type of activity. The first day of Couch to 5K started with a 5 minute warm up walk then alternate 60 seconds of jogging and 90 seconds of walking followed by a 5 minute cool down walk. Although I didn’t know what to expect, it wasn’t that daunting to see such small periods of running. The program requires that you do it three times a week, which I attempted to do on Monday, Wednesday and Friday each week. The first week repeated the same program all three days and each consecutive week slowly increments up the amount of time you run and slowly decrements the amount of time you walk between each running period, bookended by 5 minute warm up and cool down walks, until week 5, which is the first day to lack any walking intervals. The 20 minute non-stop run seemed nigh impossible for someone who had never run more than five minutes consecutively since high school, but somehow I had built up the stamina to run it successfully. An exhilarating feat that I not only surpassed a week later, but would continue to do so. By week 7, where the only walking would be before and after the running, I had the confidence and stamina to run 25 minutes straight. Then 28 and 30 minutes in weeks 8 and 9. By the end of week nine, I was running four and a half miles a day and way prepared to run a 5k at 3.1 miles. Most of my training was done on sidewalks. I attempted to find different paths as the length of my runs increased, until I was running two towns away when I was running about three miles away from my apartment. Around week 7, when I was trying to find new areas, I found a track at a school near where I live, which I could use for my late day runs and on weekends. Unfortunately, the track was just blacktop, rather than the green, springy tracks that are often found. The other problem with the track is that there was often children riding their bicycles and scooters on it, people blocking all four lanes as they slowly walk in packs around the quarter mile, and dodging soccer balls that were errantly kicked onto the track. The one advantage of the track was a flat run that didn’t have me dodging cars or getting tired out by running up and down hills. 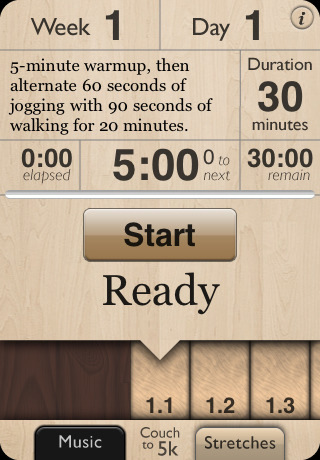 The Couch to 5K program was a great training regiment for me. It forced me to get out running three days a week, got me able to far surpass my goals for the Bronx Zoo Run for the Wild, and helped me get into much better shape than I was before I started training. The week after the 5K, I redid week 9 (5 minute warmup, 30 minute run, 5 minute cooldown), but I feel like it’s not enough now and I want to surpass even that. I want to run past my 4.5 miles and decrease my 5K time even further, while working towards a new running goal. I’m looking for a new program to take me even further and plan to start doing Lucius’ Couch to 10K, but starting at Week 4, thanks to the Couch to 5K training regiment.